After I had spent a couple of relaxing days in Darwin I decided to go further south, along the east coast. I was looking for a ride to Cairns on www.gumtree.com.au, and luckily that’s how I met Marion, a girl from France. She had come to Australia a couple of months before, on a working holiday visa, and after earning some money in a bakery, she had bought herself a van and had been driving around Australia ever since. She was always looking for company on the road, in order to share some fun and fuel costs. In Darwin I joined Marion on her way to Cairns. At the parking lot in Darwin a guy named Frank knocked on Marions car window and asked her for a ride as well. Frank is a french guy who was also here in Australia on a working holiday visa, and for the past couple of months he had been working on a farm in the south. 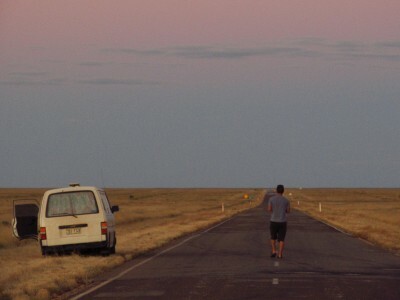 After hitchhiking up north to Darwin, he decided to go whereever the next car would take him. 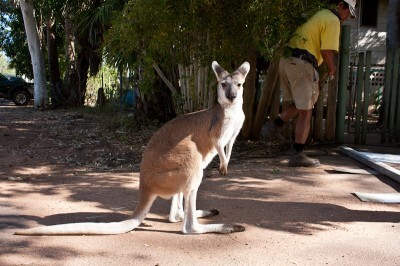 Therefore he was also joining us on our roadtrip to Cairns. We started our roadtrip early in the morning and the highway led us south. 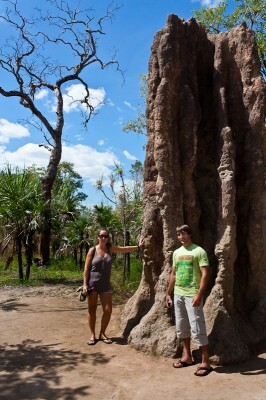 After a while we reached the Litchfield National Park, where we made a couple of interesting stops to see giant termite hills, lakes and waterfalls. After the Litchfield National Park we drove further south into the Outback of Australia. Soon we were the only car left on the road, surrounded by steppe as far as we could see, and a sign saying that the next town would be over 100 miles away. On the second day it was my turn to drive the van. It was my first time driving a car on the left side of the road with the steering wheel on the right side, and it took me a while to get used to it. In the beginning I often hit my hand on the car door, whenever I reached for the gear stick on the wrong side. When driving from Darwin to Cairns, a good thing is, that there are plenty of free camping areas along the way. Often they have bathroom installations, however no showers. Sometimes there is a river nearby where you can take a shower, or for a few dollars you can use public showers in towns or gas stations along the way. Along the way we also encountered many fascinating animals, like giant spiders, snakes, giant bats, and of course a lot of wallabies. The first dozens of wallabies I saw, were however already dead, lying on the side of the road, or sometimes even on the road. When the street signs tell you to do so, you really have to watch out for wallabies on the road carefully. On the fourth day, we saw a dead wallaby on the road too late and we ran right over it. Since then our van smelled like grilled wallaby meat for the rest of the trip. After this accident, the van also started to make funny noises. Soon after, problems with the clutch and the ignition began, and sometimes the engine died. The problems got more severe on the way, but we hoped that we would make it to Cairns somehow, where we would find a service station. After all, Frank and me were lucky, because we actually did make it to Cairns, however a hundred meters before we arrived at our hostel, the engine died again and this time the van didn’t start anymore. For Marion this was, of course, quite bad, but we helped her find a car service station, and luckily they were able to fix the van within a week. After that, she continued her trip around Australia. Frank and me found a very nice hostel in Cairns, the Reef Backpackers. We liked it there so much, that we stayed for a whole month. How you can easily kill a month in Cairns, you can read in the next post. 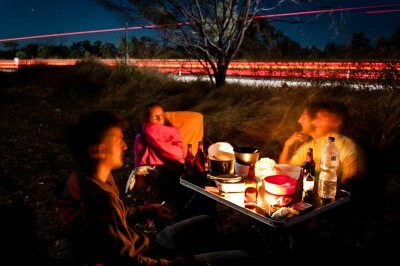 Hi, how did you find the free camping spots on your way from Darwin to Cairns? Did you look them up before you started your trip or just found then at the side of the road while driving?